Ensaaf’s groundbreaking reports document and analyze abuses and impunity, countering official denials and building evidence for accountability. 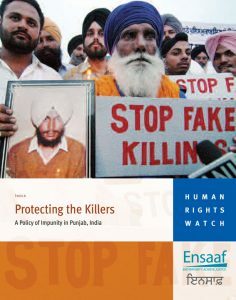 Read an in-depth analysis of the Kuljit Singh Dhatt case, including the role of state institutions in fabricating evidence, intimidating witnesses, protecting the perpetrators, and delaying justice. The report spotlights those who have stood by the truth, from family members to eyewitnesses. The family filed a case in September 1989 and a sessions court delivered a verdict on May 9, 2014. Learn why it took 25 years to reach a trial verdict and why justice still has not been delivered. 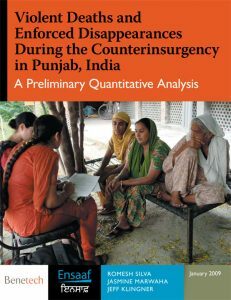 The report by Ensaaf and HRDAG, “Violent Deaths and Enforced Disappearances During the Counterinsurgency in Punjab, India,” presents empirical findings suggesting that the intensification of counterinsurgency operations in Punjab in the early 1990s was accompanied by a shift in state violence from targeted lethal human rights violations to systematic enforced disappearances and extrajudicial executions, accompanied by mass “illegal cremations.” Indian security officials have dismissed claims of human rights violations as unavoidable “aberrations” during the counterinsurgency against alleged terrorists in Punjab from 1984 to 1995. This report examines the challenges faced by victims and their relatives in pursuing legal avenues for accountability for the human rights abuses perpetrated during the government’s counterinsurgency campaign. The report describes the impunity enjoyed by officials responsible for violations and the near total failure of India’s judicial and state institutions, from the National Human Rights Commission to the Central Bureau of Investigation (CBI), to provide justice for victims’ families. In March 2007, Ensaaf released the second edition of Twenty Years of Impunity. More than two years had passed since the publication of the first edition. 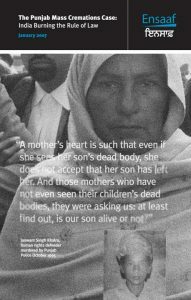 During that time, the Justice Nanavati Commission of Inquiry submitted its report to the Indian government, the Congress administration submitted an Action Taken Report to Parliament, and Prime Minister Manmohan Singh apologized, but refused to accept state responsibility for the massacres. The report inclues a new chapter that succinctly articulates the failings of the Nanavati Commission and the Action Taken Report, after a thorough consideration of the evidence at the government’s disposal. 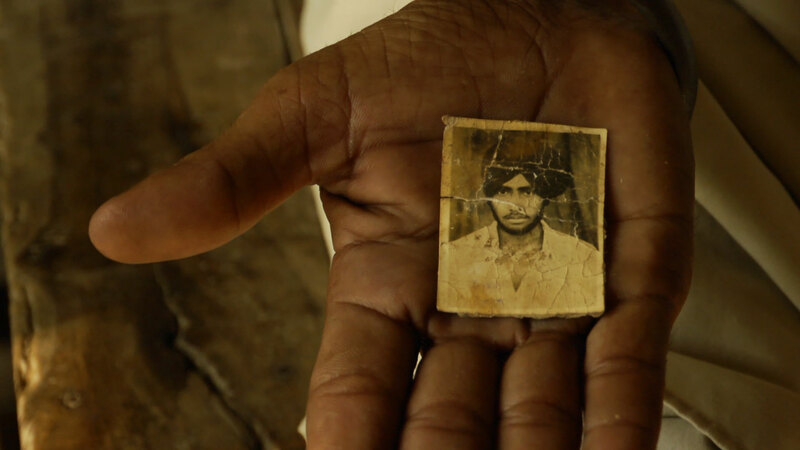 From 1984 to 1994, Punjab security forces engaged in counter-insurgency operations that included widespread and systematic human rights abuses such as torture, disappearances, and extrajudicial executions, which claimed an estimated 10,000 to 25,000 lives. 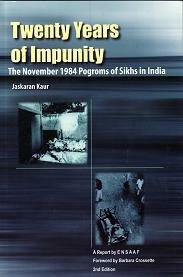 In the early 1990s, Director General of Police (Punjab) KPS Gill expanded upon a system of rewards and incentives for police to capture and kill militants, leading to an increase in disappearances and extrajudicial executions of civilians and militants alike. Hundreds of perpetrators, including all of the major architects of these crimes, have escaped accountability. This report details human rights violations committed by Indian security forces in recent militancy-related arrests. 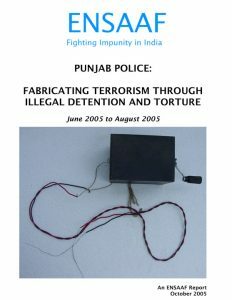 From June 2005 to August 2005, Indian police claim to have arrested several dozen individuals intent on reviving or supporting militancy in Punjab. These arrests center around the apprehension of Jagtar Singh Hawara, the main accused in the 1995 assassination of Punjab’s chief minister. On April 15, 2015, Ensaaf reached out to Congressmen and Senators on behalf of U.S. citizen Ravinderjeet Singh. 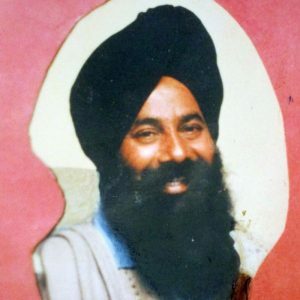 The letter discusses the threats, false charges, illegal and arbitrary detention, and physical abuse suffered by Ravinderjeet Singh by government and security forces in Punjab, India. For a copy of each letter, please click on the following links: Congressman Chris Smith; Senator Dianne Feinstein; Senator Barbara Boxer; Congressman Jerry McNerney. Ensaaf, in partnership with The Sikh Coalition and Human Rights Watch, sent a letter today to President Barack Obama, urging him to support justice for the 1984 anti-Sikh massacres, which claimed the lives of thousands of Sikhs throughout India 30 years ago. Ensaaf, Jakara Movement, Sikh American Legal Defense and Education Fund, Sikh Coalition, Sikh Research Institute, United Sikhs and Voices For Freedom issued letters to the United States Department of State (pdf), Commission on International Religious Freedom (pdf), and the Tom Lantos Human Rights Commission (pdf).